The film opened on Privet Drive (in Little Whinging, Surrey) where powerful wizard Professor Albus Dumbledore (Richard Harris) magically extinguished the streetlights. He was accompanied by Professor Minerva McGonagall (Maggie Smith), with the ability to morph into a cat. Long-haired, bearded half-giant Rubeus Hagrid (Robbie Coltrane) riding a flying motorcycle delivered an orphaned sleeping baby to Dumbledore - he deposited the infant on the doorstep of a Muggle ("non magic folk") couple, relatives Aunt Petunia Dursley (Fiona Shaw) and Uncle Vernon Dursley (Richard Griffiths): "The only family he has." The two knew the boy would one day be famous and every child would know his name: "Harry Potter." He had a lightning bolt-shaped scar on his forehead (due to a fateful encounter with Lord Voldemort when he lost his parents). In the next scene about ten years later, pre-teen orphaned Harry Potter (Daniel Radcliffe) was living in the "cupboard under the stairs" in the Dursley household, where he was subjected to misery, drudgery, constant orders and second-class existence with his relatives. On an outing to the London Zoo with spoiled, bullying and fat cousin Dudley (Harry Melling) who was celebrating his birthday, Harry spoke to a giant Burmese python-snake in the Reptile House, and released it from captivity, and put Dudley in its place inside the exhibit case. Uncle Vernon harshly scolded Harry and vowed: "There's no such thing as magic." Owl-postal delivery brought Harry a letter from Hogwarts School of Witchcraft and Wizardry, but it was confiscated. After many more failed attempts, owls surrounded the home as it was inundated with a torrent of letters, forcing Uncle Vernon to take the entire family away to a deserted island. On the stroke of midnight when Harry turned eleven and made a wish, Hagrid (Keeper of Keys and Grounds at Hogwarts) broke down the door and delivered a birthday cake to Harry. He was told a shocking truth: "You're a wizard, Harry" (something Harry had not been told by the Dursleys, who thought wizards were abnormal freaks) and that his parents had been educated at Hogwarts. Hagrid handed him a Hogwarts School acceptance letter for the next school year. Harry then learned that his parents, James and Lily Potter, were "blown up" when he was one year old, and not killed in a car crash, as he had been led to believe by the Dursleys. Hagrid insisted that Harry was going to attend the fine school of Hogwarts, although Vernon believed he would only be taught "magic tricks." Hagrid took Harry to London to shop for school supplies in the magically-hidden Diagon Alley, where he first met his turbaned, Defense Against the Dark Arts teacher Professor Quirrell (Ian Hart). Harry was taken to Gringotts Bank, a wizard bank run by unfriendly but clever goblins, where he found he was very wealthy - in Vault 687, he was shown stacks of gold coins, bequested to him from his parents. From Vault 713, Hagrid took a small wrapped package, but kept its contents highly secret. Hagrid guided Harry to various shops to buy his books and equipment - purchasing his own very special wand from Ollivanders, where proprietor Mr. Ollivander (John Hurt) boasted: "I remember every wand I've ever sold, Mr. Potter." He described how the most effective wand for Harry was the "brother" of the wand that scarred his forehead ("its brother gave you that scar"), curiously owned by Lord Voldemort ("We do not speak his name"): "The wand chooses the wizard, Mr. Potter." Harry was told that "great things" were expected from him: "He-Who-Must-Not-Be-Named did great things. Terrible, yes, but great." After the darkly evil/cruel wizard Lord Voldemort (Richard Bremmer) had killed Harry's parents, the young boy was given the forehead scar. Hagrid described how Harry's scar mark meant he was touched with an evil curse. He learned from Hagrid that "not all wizards are good." In a flashback to "dark times," Voldemort was shown gathering followers and bringing them over to the Dark Side, and killing his opponents. Voldemort had attempted to kill Harry when he was only one, but was unable to ("Something about you stumped him that night. That's why you're famous. That's why everybody knows your name. You're the boy who lived"), and then mysteriously vanished. She added: "Your house will be like your family." Each house earned points for triumphs, and lost points for rule-breaking. At the end of the school year, the house with the most points won the House Cup. Harry then met his arrogant, prejudiced arch-nemesis - a privileged blonde student named Draco Malfoy (Tom Felton), before they entered the Great Hall (with changing ceiling decorations) for the school's opening dinner and Sorting. Headmaster Professor Albus Dumbledore also welcomed the students, and reminded them that the Dark Forest and Hogwarts' third-floor corridor were out of bounds. Draco was assigned to the House of Slytherin with his gang-buddies Crabbe and Goyle, while Hermione, Ron, and Harry were assigned to the House of Gryffindor. During the ceremony, when devious Potions Master Professor Severus Snape (Alan Rickman), the Head of Slytherin House, glared at Harry, he felt pain in the scar on his forehead. In their first Potions class, Snape ominously told his students: "I can teach you how to bewitch the mind and ensnare the senses. I can tell you how to bottle fame, brew glory, and even put a stopper in death." He picked on Harry as "our new celebrity" and then provokingly questioned him to embarrass and belittle him: "Fame isn't everything, is it, Mr. Potter?" After mail delivery, Harry read in the Daily Prophet newspaper that there was an attempted robbery at Gringotts "believed to be the work of dark wizards or witches unknown," although the goblins insisted that nothing was taken from Vault 713 which had been emptied earlier in the day (Harry recalled that Hagrid had taken a small package from the vault). The new pupils attended broomstick flying lessons, during which Neville Longbottom (Matthew Lewis) crashed to the ground on his out-of-control broom, and broke his wrist. During the confusion, Draco snatched Neville's spherical, clear Remembrall (a magical device that turned red when its user had forgotten something) and flew off, with Harry giving chase on his broomstick. After Draco threw the fragile glass ball high into the air, Harry quickly retrieved it and saved it from breaking, and for his skill was appointed Seeker of the Gryffindor Quidditch squad by McGonagall. The trio of Ron, Harry, and Hermione found themselves in the forbidden third-floor corridor when the changing staircases led them there. They hid in a room where they discovered a massive, fierce three-headed dog. Only Hermione noticed that the monstrous creature was standing over a trap-door, and she believed it was guarding something. Preparations were underway for a game called Quidditch with players (seven to each House team, including 3 Chasers, 2 Beaters, 1 Keeper and 1 Seeker) zooming around on broomsticks in an open-air arena surrounded by spectator towers, with the Seeker's job to catch a fast-moving, winged Golden Snitch. In Charms class, led by small wizard Filius Flitwick (Warwick Davis) - head of Ravenclaw, Ron became upset over Hermione's know-it-all proficiency (with the spell-command Wingardium Leviosa), and criticized her skillful wand ability as a "nightmare." After class, when she overheard the criticism and her feelings were hurt, she went off crying and hid in the girls bathroom for the rest of the day. That same evening, Halloween night, cowardly Professor Quirrell rushed into the dining hall, shouting: "Troll in the dungeon" before he fainted. As the students were evacuated by prefects to safety in their dormitories, Ron and Harry rushed to notify Hermione, and found her trapped in one of the toilet cubicles by a fully-grown Mountain Troll. Harry was threatened after stabbing the Troll in the nose with his wand, forcing Ron to use the spell he had just learned (with Hermione's aid) to levitate the Troll's club and knock the beast out. When McGonagall arrived with Snape and Quirrell, Hermione humbly took the blame and praised the two boys for saving her life - cementing their friendship further. After noticing Snape's bloody leg and limp, Harry hypothesized that Snape had let the troll into Hogwarts as a diversion, so he could get past the 3-headed dog, but he had been bitten. And he concluded with his belief that the dogs were guarding the secret package Hagrid had retrieved from Gringott's Vault 713. In the first Quidditch match of the year between Slytherin and Gryffindor, an aerial form of rugby, Harry flew on a new Nimbus 2000 broomstick (sent to him anonymously) as Gryffindor's Seeker, with the game's object - to be the first to catch the Golden Snitch (with the ability to sprout wings) and win the game. During the early moments of the competition when Gryffindor was winning, Slytherin's team began to use dirty tactics, and then suddenly, Harry's broomstick went dangerously out of control. Quick-witted Hermione observed, through her binoculars, that Professor Snape (Head of Slytherin House) was muttering a chant at Harry and presumably responsible ("He's jinxing the broom"). She rushed over to Snape's viewing stand, uttered the wand-command Lacarnum Inflamarae, and set his robe on fire. Her actions saved Harry as he regained control, and won the game by catching the Golden Snitch, to Snape's consternation. Hagrid denied that Snape would put a curse on Harry's broom, and then admitted that he owned the 3-headed dog, named Fluffy, that was lent to Dumbledore to guard the trap-door contents from theft. Hagrid also accidentally mentioned the mysterious name Nicholas Flamel. At Christmas time at Hogwarts (where Harry and the Weasley students remained during the holidays), Harry received a present from another anonymous individual advising "Use it well" - something passed on from his father - a rare Invisibility Cloak. He was soon using it to search in the school library's Restricted Section for information about Flamel, but aroused the suspicions of the school's caretaker Argus Filch (David Bradley) and his spying cat Mrs. Norris, as well as Professor Snape. In a secret room, he came upon the Mirror of Erised, where he saw the reflection of his dead parents. When he brought Ron to view the mirror, Ron only saw himself as "head boy...holding the Quidditch Cup" as the captain. Rather than showing the future, the mirror displayed what the viewer most desperately wanted. According to Dumbledore, it reflected "the deepest and most desperate desires of our hearts". He had found Harry addicted to the Mirror's visions of loving family life. He warned it could become destructive - and therefore it had to be removed ("It does not do to dwell on dreams, Harry, and forget to live"). Once the holidays were over, Hermione shared her findings about alchemist Nicholas Flamel, the only known maker of the Sorcerer's Stone, a legendary substance with astonishing powers: "It'll transform any metal into pure gold, and produces the Elixir of Life which will make the drinker immortal." The 665 year-old Flamel was in possession of the only known Philosopher's Stone in existence - believed to be under the trap-door in the floor that was guarded by Fluffy. The trio also thought that Snape was trying to steal the Stone. When they informed Hagrid in his hut late one evening about their knowledge of the Sorcerer's Stone, Hagrid insisted that Snape was only protecting the Stone. They discovered him hatching a baby dragon - a young Norwegian Ridgeback dragon named Norbert that spewed fire, which he had won from a stranger in a pub. After the mischievous Draco spied on them with Hagrid and reported their after-hours wanderings to Professor McDonagall, the trio was given point deductions, and all four were punished with detentions. And Hagrid's Norbert was sent off to Romania by Dumbledore, since it was against wizard law. Hagrid led the four punished students to serve their detentions in the forbidden Dark Forest, where they were shown unicorn's blood, and told to locate and rescue the badly-injured creature. After Draco fled in fear, Harry was confronted with a dark-hooded, disembodied figure that appeared to be feasting on the blood of the slain unicorn, and causing Harry pain on his scarred forehead. A centaur named Firenze (voice of Ray Fearon) saved Harry from the "monstrous creature" that had committed the crime of slaying the unicorn in order to drink from its blood to give it cursed strength: "Drinking the blood of a unicorn will keep you alive even if you are an inch from death. But at a terrible price. For you have slain something so pure that from the moment the blood touches your lips, you will have a half-life. A cursed life." Harry realized that Firenze was referring to Lord Voldemort, and later also determined that Snape didn't want the Stone for himself, but for Voldemort, who was plotting a comeback to power by acquiring the Sorcerer's Stone: "With the Elixir of Life, Voldemort will be strong again. He'll come back." Although Harry feared for his life, Hermione felt he was safe in Dumbledore's presence. Harry continued to feel a burning sensation on his scar - possibly a danger warning. And then, Harry suddenly thought it was too much of a coincidence for Hagrid to receive an illegal dragon's egg. When questioned, Hagrid told Harry that the faceless stranger in the pub was hooded, and had asked about Hagrid's 3-headed dog Fluffy. Hagrid had dumbly admitted that Fluffy could easily be calmed and made to go to sleep with music - the way to get past the creature and secure the well-protected Stone. The trio also learned that Professor Dumbledore was called away by the Ministry of Magic in London, and now Harry was vulnerable, as he worried: "...the Sorcerer's Stone...Someone's going to try and steal it." Harry guessed that Snape was the hooded stranger (who had lured Dumbledore away), and that he was imminently planning to steal the Stone with Dumbledore absent: "He knows how to get past Fluffy." Harry proposed to his two friends that they enter the trap-door that evening. As the trio prepared to leave, Neville Longbottom warned his friends about sneaking out, worried that Gryffindor would again find itself in trouble. He proposed fighting them, but Hermione used her wand-charm Petrificus Totalus to subdue him by petrification, and he fell stiff to the floor. 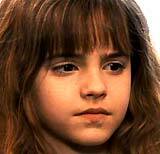 Ron noted that Hermione was "brilliant, but scary." When they entered the chamber wearing the Invisibility Cloak, they found to their surprise that the beast was already snoring: "Snape's already been here. He's put a spell on the harp." But when the harp music stopped, the snarling, 3-headed dog awakened as they jumped to safety through the trap door. Confronted by a series of obstacles, they first found themselves wrapped up in vines by the Devil's Snare, and escaped by relaxing rather than resisting (although Ron was released by Hermione's spell of sunlight). Then Harry was assaulted by flying keys, one of which opened a door that led to a giant chessboard. The goal of their Black Team was to play their way across the room by defeating the opposing chess pieces of the White Team, in a "real wizard's" chess game. As Ron called the individual moves, the chess pieces obliterated each other - until Ron was forced to sacrifice himself as the Knight to the opposing Queen, so that Harry (as Bishop) could checkmate the King. Harry continued alone, after sending Hermione to the owlery to send a message to Dumbledore. In the final dungeon room, Harry found Professor Quirrell standing in front of the Mirror of Erised, as he confessed that it wasn't Snape who was trying to kill him. [During the Quidditch match, Snape had actually been muttering a counter-curse to try and save Harry - Snape hadn't been fooled and had suspected Quirrell all along.] Quirrell had allowed the menacing giant Troll at Halloween to enter Hogwarts as a diversion (and shouted the warning in the dining room), while Snape had run to the 3rd floor to head off Quirrell from stealing the Stone. As Quirrell gazed into the Mirror, he saw himself holding the Stone, but didn't know how to acquire it. A voice whispered: "Use the boy." When Harry looked into the Mirror, he saw himself holding the Stone and putting it in his pocket (both in the mirror and in reality), but deceived Quirrell about what he saw. Voldemort was Quirrell's Master, commanding him to serve him and do his bidding. When Quirrell unwrapped his turbaned head, the face of Voldemort was revealed talking on the back of his head. Voldemort had parasitically possessed the body of turbaned Professor Quirrell: "Unicorn blood can sustain me, but it cannot give me a body of my own, but there is something that can" - the stone in Harry's pocket. Voldemort threatened Harry with an horrific death, or the option to join him and live. He also tempted Harry about seeing his parents again: "Together, we can bring them back. All I ask is for something in return. (Harry held out the stone) That's it, Harry. There is no good and evil. There is only power, and those too weak to seek it. Together, we'll do extraordinary things. Just give me the Stone!" Voldemort commanded Quirrell to seize the Stone, but Harry's magical power of touch caused Quirrell's flesh (on his hand and face) to sizzle, burn and disintegrate. As Harry squeezed the large reddish Stone in his hand, Voldemort's ghostly spirit knocked him backwards on the floor, rendering him unconscious, and then flew off. While recovering in the school infirmary, Professor Dumbledore told Harry that the Stone had been destroyed. He had first discussed its destruction with Nicholas Flamel, who agreed that he had enough Elixir to last awhile before his death. Harry then learned how he had acquired the Stone in his pocket: "Only a person who wanted to find the Stone, find it but not use it, would be able to get it." Harry asked if Voldemort would return, with the Stone gone, and was told: "I'm afraid there are ways in which he can return." Quirrell couldn't survive Harry's magical touch because of the power of his mother's love: "She sacrificed herself for you. And that kind of act leaves a mark...It lives in your very skin...Love, Harry. Love." Harry's friends had survived as well, and at the closing dinner at the end of school, the Gryffindor House (in 4th place) was victorious over Slytherin for the House Cup when a few last-minute extra points were awarded to Gryffindor: 50 points to Hermione for "the cool use of intellect while others were in grave peril," 50 points to Ron Weasley for "the best-played game of chess," 60 points to Harry Potter for "pure nerve and outstanding courage," and a final 10 points to Neville Longbottom for standing up to his friends. Harry bid his good pal Hagrid goodbye before boarding the Hogwarts Express back to London. Hagrid advised him to use magic on cousin Dudley Dursley during the summer if he caused any further trouble, but Harry responded: "But we're not allowed to do magic away from Hogwarts. You know that." Hagrid quipped: "I do, but your cousin don't, do he?" Harry didn't feel like he was going home - his real home was with his friends at Hogwarts. All of the films in this incredible fantasy/adventure film series were based upon adaptations of the J. K. Rowling books. 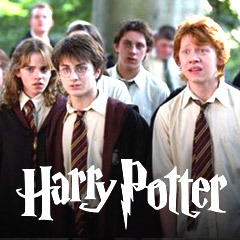 The first film was based upon Rowling's 1997 novel Harry Potter and the Philosopher's Stone. With a production budget of $125 million, its box-office was immense, $317.5 million (domestic) and $975 million (worldwide), and the highest grossing film of 2001, just surpassing The Lord of the Rings: The Fellowship of the Ring (2001) at $313 million. Harry Potter and the Sorcerer's Stone (2001) was finally surpassed as the single, # 1 highest (domestic) grossing film of the franchise by the last film, Harry Potter and the Deathly Hallows, Part 2 (2011). Key Scene: The revelation of the face of Voldemort grafted onto the back of Quirrell's head - it was the first post-infancy encounter Harry had with the Dark Lord. With three Academy Award nominations (with no wins): Best Art Direction, Best Costume Design, and Best Original Score. Some religious controversy surrounded the film in regards to its celebration of witchcraft and magic.